AIA National Convention Report | PHILAIADELPHIA! As one of your delegates representing AIA Central PA it is my pleasure to provide you with a recap of the 2016 AIA National Convention hosted by our very own City of Brotherly Love, Philadelphia. The convention kicked off on May 19 and continued through Saturday, May 21 with AIA National reporting over 20,000 in attendance. The recurring highlight of the AIA Convention in my eyes, which will not change no matter the locale, is the opportunity at every turn, whether it be a general session, keynote speaker, educational tour, business session, alumni or regional reception, to connect with and gain knowledge from people from around the world who share a passion for architecture. Neri Oxman’s keynote entitled “Design at the Intersection of Science + Engineering” was another highlight of the convention. Neri (architect, designer, and MIT professor) along with the MIT Meditated Matter design research group “conducts research at the intersection of computational design, digital fabrication, materials science and synthetic biology and applies that knowledge to design across scales from the micro scale to the building scale.” Her goals are “to enhance the relationship between the built and the natural environments by employing design principles inspired or engineered by Nature and implementing them in the invention of novel digital design technologies. Areas of application include product and architectural design, as well as digital fabrication and construction.” To say this keynote was inspiring and mind blowing is an understatement, it certainly spoke to the Convention theme of Imagine+. I encourage you to check out her recent TED talk and be prepared to be blown away. The two other keynote speakers this year were Julia Louis-Dreyfus and Rem Koolhaus. During the annual business meeting various bylaws, amendments and resolutions were voted upon. A full listing can be found here: http://www.aia.org/components/AIAB108091. The following AIA National officials were also elected into office by delegates during the Convention—2017 First Vice President/2018 President Elect – Carl Elefante, FAIA (AIA Potomac Valley), 2017-2018 Secretary – Bruce W. Sekanick, AIA (Eastern Ohio) and 2017-2019 At-Large Director – Peter Exley, FAIA (AIA Chicago). 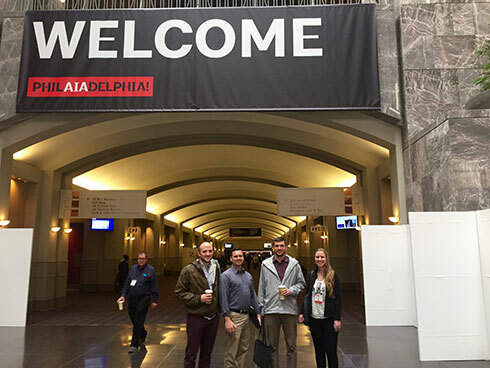 The close proximity of convention this year allowed many of our AIA Central PA Board members to attend and we hope you, as a member, also had the opportunity. This year I opted to volunteer 10 hours of my time, which gave me free registration for the entire convention. As a volunteer, I participated in education tours as a chaperone and monitored doors for sessions, scanning badges and helping fellow architects. I would say my interaction with attendees was increased tenfold and I had the opportunity to meet a lot of people I would not have met otherwise as a regular attendee. I would strongly encourage everyone to take advantage of this opportunity for the upcoming 2017 AIA National Convention in Orlando April 27-29 at the Orange County Convention Center. If you would like more information on my personal volunteer experience and the process of registering as a volunteer please feel free to reach out to me at kleed@cra-architects.com. AIA Central PA will be issuing communications regarding registering as a volunteer for Orlando information is available. AIA Central Pennsylvania presents the Annual Excellence in Design Awards, recognizing design and excellence among its members and fostering public awareness of the Architects’ role in shaping the built environment. Submit your design awards through our website and online submission feature! 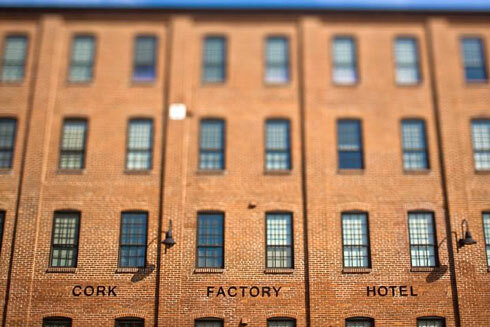 This year we are holding the Expo and Design Awards at the Cork Factory Hotel at Urban Place in Lancaster PA. If 19th century brick walls and wood ceilings could talk, they would speak a familiar narrative. Enterprise & industry. American vision. An honest day’s work for an honest day’s pay. The buildings that make up Cork Factory Hotel once housed the historic Armstrong Cork and Kerr Glass companies. Today, the hotel preserves and honors that history. And it is not just in the architecture, it’s the attitude: honest, authentic, and welcoming. The day will begin at 11:00am on October 20th with a tour of the Urban Place campus and will continue with several exciting CEU seminars and Vendor Expo. Happy hour will begin at 4pm with heavy hors d’ oeuvres and cocktails followed at 6pm with the Keynote Speaker and the Design Awards. Submissions are due July 25, 2016. Winners will be announced and all work celebrated at the Design Awards Celebration on Thursday, October 20, 2016, at Cork Factory Hotel, 480 New Holland Ave #3000, Lancaster, PA.
For more information, to submit your project, or to register for the Conference and Expo or the Design Awards Event, go to www.aiacentralpa.org or email aiacpc@aiacentralpa.org. The cost per entry is $100. Tickets to the whole day Event may be purchased separately at $40 a ticket. Thank you to our Design Award Sponsors! Submissions accepted until July 25, 2016, at 4:00pm. IA Central PA will be hosting a series of events to provide opportunities for professionals in our area to get to know one another. Central PA encompasses a large area with many talented individuals, ranging from student interns to highly experienced registered architects. It’s time we met! The emerging professionals summer series is our first step. The 2016 AIA Central PA Spring lecture was held on May 19th at Armstrong World Industries with Jonathan Segal, FAIA. Jonathan is a residential architect and developer located in San Diego, CA. Jonathan started the conversation speaking about his passion: CARS! By being successful at his work, Jonathan explained that architecture has opened doors for him to travel, purchase cars, and fully indulge his appetite for “big boy toys.” He explained that this same kind of opportunity is open to all architects and that there really is no big secret to his success. Jonathan’s approach to architecture can only be described as unorthodox. Unlike many lecturers we’ve hosted in the past, he did not speak at length to his design process or stylistic preference. Segal briefly discussed a design process that has successfully worked for him, but spent most of the lecture explaining his approach to building projects: as the developer. He spoke about how his role as the developer frees him from the pitfalls many architects face during design and construction such as change orders, budget constraints, and delays to board approvals. Instead, Segal repeatedly works directly with contractors who understand his design and detail intent and can side-step RFIs, change orders, and delays. He strongly advocated the Architect gaining control of the entire building process, pressing that the Architect’s role has been diminished and that we have the ability to reverse that trend. When asked if he would like to expand his project type from residential into other areas, Jonathan was quick to answer “no.” He described his experience with an opportunity to work for a high-profile client that left a bad taste in his mouth. Instead of being at the mercy of schmoozing and marketing potential clients, Segal would rather stick with his process that has proved to be successful and allows him the time to spend driving his cars. He challenged all of us to consider his unique view point. Conversations with a potential lecturer for this fall are underway. Once we have confirmation on the speaker we will set the date and location, so stay tuned! The Lecture Committee is open to suggestions for locations and speakers for our upcoming lectures. 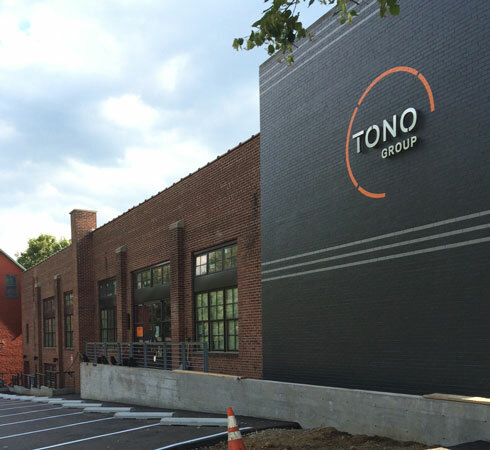 Lancaster, PA—(June 27, 2016)— TONO Group (comprised of TONO Architects, PROTO Construction, and Interiors by DECO) moved from its rented 3,400-square-foot office at Wheatland Place into its own 12,000-square-foot building located at 436 West James Street in Lancaster’s northwest end. The company’s $2 million investment project is the first of its kind to exemplify RETRO Development—launching the newest business entity in TONO Group’s family of businesses. The move and launch of a new entity solidify a time of growth as TONO Group continues its fifteenth year of business. To date, the companies have hired 14 new employees this year and continue to expand. 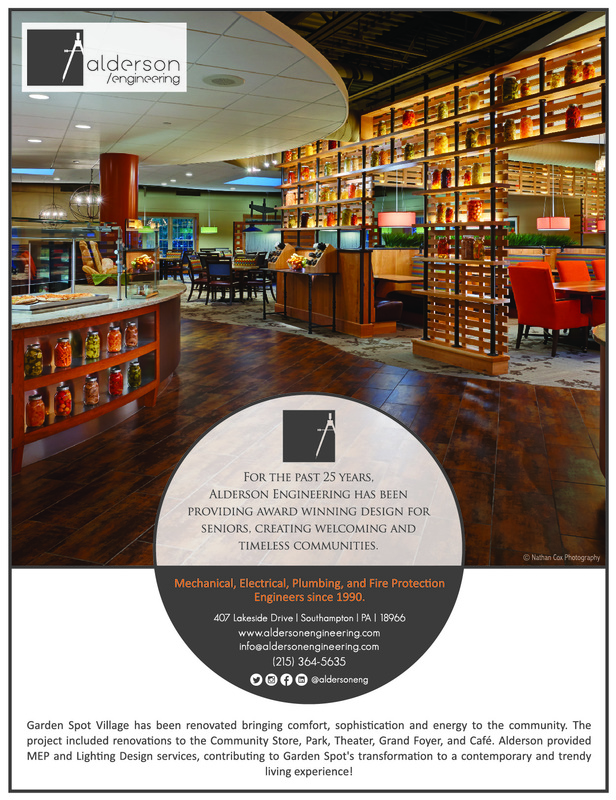 Portfolio projects include healthcare, education, retail, commercial, senior living, and private residential works. 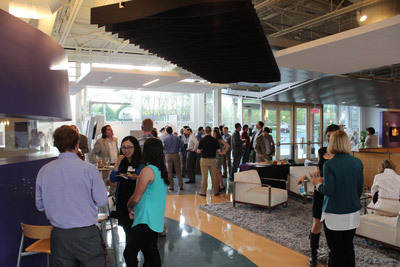 The 22 employees will work together to strengthen TONO Group’s design-build collaborative concept, furthering the company’s “creating meaningful places” initiatives and strengthening their influence in the local Lancaster County market, where they have roots, as well as expanding throughout the Mid-Atlantic region. RETRO Development self-develops the places and spaces within the fabric of a city where holes in the landscape exist because of neglect, decay, blight, or a devaluing process. Taken from the word retrofit, the entity rehabilitates existing infrastructure—thereby becoming a living, transformative example of smart growth and sustainability. By taking ownership and personal responsibility of developing, planning, building, and decorating, TONO Group seeks to have the greatest-good impact on the built environment from start to finish. “Although our core mission remains steadfast to make inspired places, we are evolving to better influence the construction process and deliver the best value to our clients,” says owner and managing principal D. Hunter Johnson, AIA. The facility houses TONO Group’s offices as well as Luca, a new wood-burning Italian restaurant leased by chef Taylor Mason, proprietor and chef of Ma(i)son. Originally constructed in 1944 as a Food Fair grocery store, Johnson and investor Art Dodge purchased the building from Fred Cook, then owner of Lestz & Co., a small wholesaler of hardware and dry goods. Highlights of the space include beautifully-refurbished maple floors, original bowstring timber trusses, and two new steel-framed mezzanines. The finished spaces combine the collaborative united workflow of RETRO Development, TONO Architects, PROTO Construction Management, and Interiors by DECO. The company has completed various local projects for Listrak, Armstrong World Industries, Oak Tree Development, Penn Stone, The Lancaster County Community Foundation, Lancaster General Health, Willow Valley Associates, The Palate Company, Luca, Aussie & The Fox, Passenger Coffee, and Prince Street Cafe. It also continues to grow throughout the Mid-Atlantic region, having completed work for Virtua Health, Pinnacle Health, Hilton Hotels, and Clark Shoes, to name a few. For more information, please contact Nicole Patterson at npatterson@tonogroup.com or call 717.735.8166. 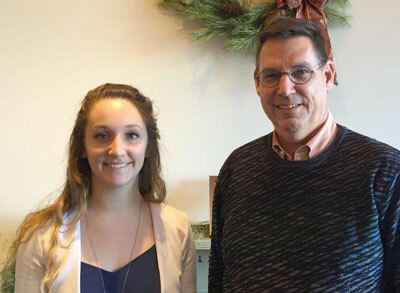 The Central PA Architects Foundation Fund (CPAFF) Architecture Scholarship has been awarded to Hannah Bahney, a fourth year Architecture student attending Tulane University in New Orleans, Louisiana. Hannah Bahney is the fifth recipient of the annual CPAFF Architecture Scholarship and will receive a $1,000 award. Hannah was the unanimous selection of the Foundation Advisory Committee as the 2015 recipient after their review and evaluation of an impressive group of scholarship applications received during spring/summer 2015. Financial need, community involvement, volunteer activities, and examples of design work are considerations in the scholarship recipient selection process. The Foundation Advisory Committee is comprised of Past-Presidents of the AIA Central Pennsylvania Chapter. To be eligible for the CPAFF scholarship, student applicants must be currently enrolled in an architecture degree program: two year or four year undergraduate program, five year professional program, or graduate program leading to a Masters degree. Present or former residency is required from one of the thirteen counties within the AIA Central Pennsylvania Chapter Region. Hannah Bahney is a resident of Myerstown, Pennsylvania in Lebanon County. Hannah Bahney will be spending the Fall 2015 semester in Spain studying Architecture, and will be unable to attend the AIA Central PA Expo and Design Awards Program on November 2, 2015, where her selection as the CPAFF scholarship recipient will be announced. 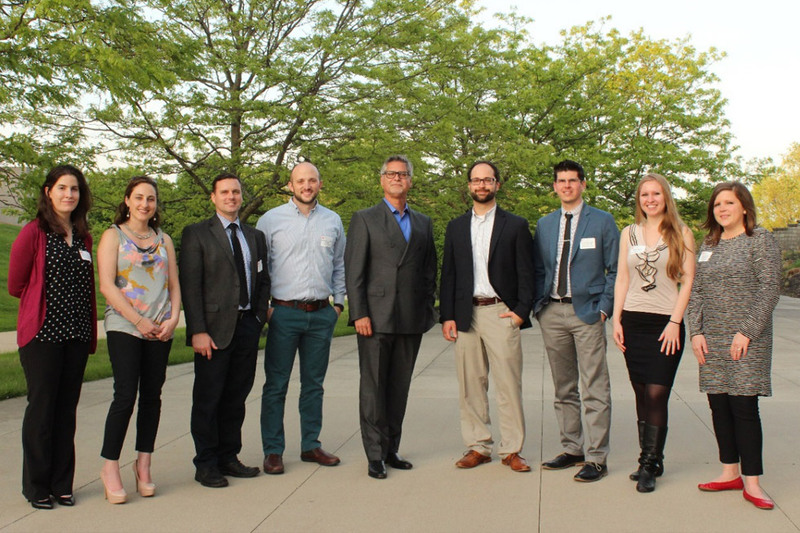 The Central PA Architects Foundation Architecture Scholarship was established as a permanent restricted scholarship fund in conjunction with The Foundation for Enhancing Communities (TFEC) headquartered in Harrisburg, Pennsylvania which administers the Fund. Annual fundraising efforts by the Foundation Advisory Committee and AIA Central PA Chapter continue to preserve and grow the endowment, and increase the annual award. Tax deductable donations may be made online through the AIA Central PA website link to TFEC. The 2016 Scholarship Application Forms may be submitted by eligible students anytime after April 1, 2016, and prior to June 30, 2016, with the award determination made by the CPAF Advisory Committee no later than August 15, 2016. Architecture Scholarship Application Forms will be available in 2016 through the TFEC and AIA Central PA Chapter websites. While in college, I was lucky enough to study in Italy for a semester in 1995. It was one of the defining experiences of my life. At the end of our studies in Italy, I was able to backpack to several other counties by train. I loved Italy, but while many aspects of Italian city-life are modern, their architecture is relentlessly classical. On the train ride it was obvious that the further north we got, the more modern the buildings became. Our small band of backpackers ended up staying a few days in Paris about midway through our trip. Paris had a scale and a blend of styles that I had not seen since landing in Rome. As a young student, I made it my mission to see as many “famous” buildings as possible with the time I had. 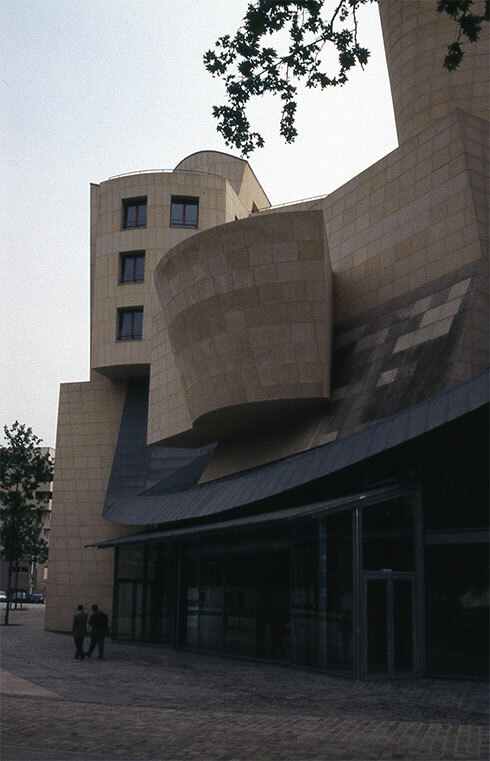 One stop I had to make was the American Center in Paris, designed by Frank Gehry. 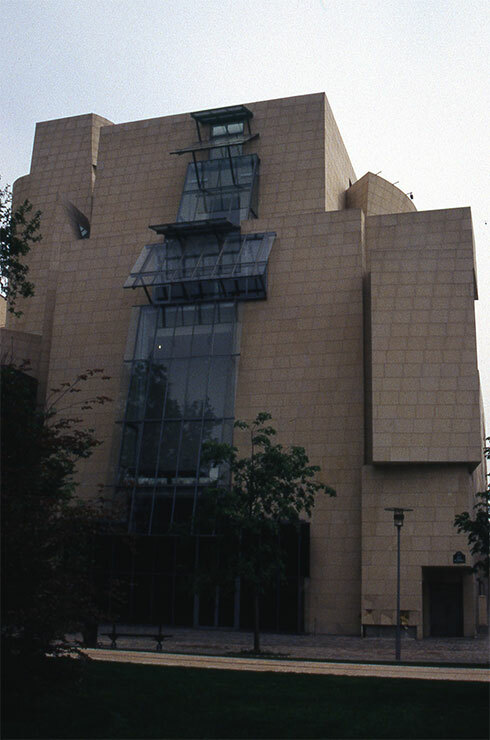 At the time, Mr. Gehry had little of his public acclaim earned by his later works like the Guggenheim commission in Bilbao, Spain. He was; however, quite well know in architectural circles by this time. The American Center was his largest and most famous commission to date, and I had to see what all the fuss was about. The view as seen in many publications about the American Center in Paris. The building was not located anywhere near the center of the city, but on the outskirts along the river with many other modern buildings I could only assume were corporate office buildings. The façade was not as pristine as it had appeared in the magazines, either. It was dirty and several of the thin, stone veneer panels were kicked in, exposing the insulation behind. I thought maybe that the French were none too pleased with the American presence in Paris as the building had only opened one year prior to my visit. The building itself I felt was anti-contextual, taking no cues from the surrounding environs. The sweeping and curved forms related to absolutely nothing I could see from my vantage point. I couldn’t imagine how that exterior translated into any kind of reasonable interior. By the way, no one ever hired me as an architectural critic, so I will be keeping my day job. Look closely at the bottom right and you see some suspicious damage to several panels. 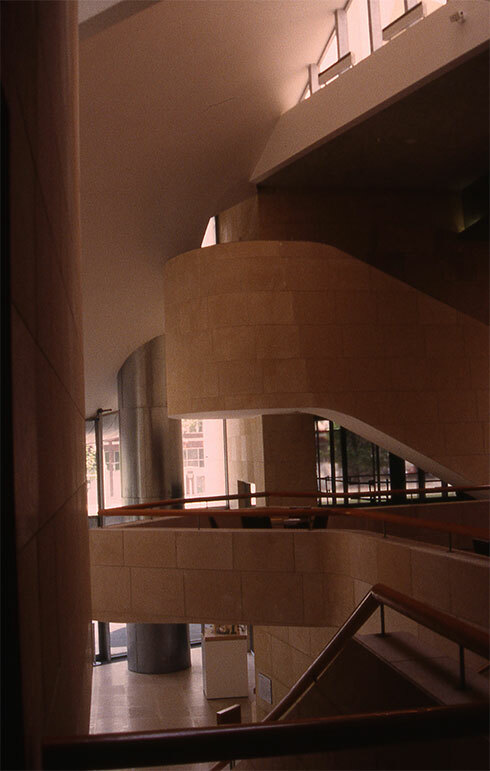 When I entered the main lobby, I found that most of the curved exteriors were part of a vast and complex atrium. Then I noticed that there was hardly any one in there with me. Come to think of it, I still don’t know what the main function of that building was. I snooped around as much as I thought I could without getting cursed at in French. The most telling investigation came when I found a bathroom. I couldn’t open the door fully. I found the obstruction to be a fixture itself. Even as a student, I know that didn’t fly in a public toilet room (it was not a private toilet room). Yeah, I took a picture in the toilet room. 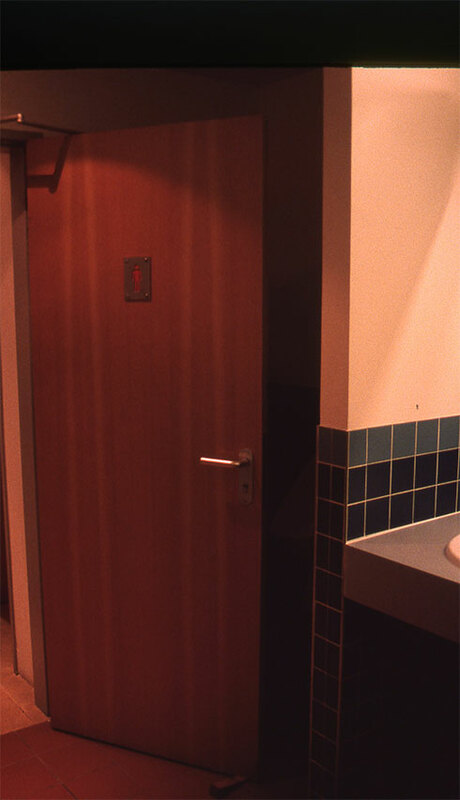 The door stop was the urinal. I left feeling a bit jaded. This exorbitantly expensive and controversial building had failed to deliver. I’m not saying I kicked in any stone panels on the façade, but I now understand why there were so many. Looking back and looking at my pictures, I think I was the lone person in the building aside from the “friendly” receptionist (I was and American after all – what was her problem?). A year later I learned that the Center went bankrupt and closed it doors; at least they closed them as tightly as they could in spite of any obstructions. The great, empty interior, shared by my friend, the receptionist. I have far more positive memories of the other modern buildings I saw in Paris, including Centre Pompidou, Villa Savoye, and Parc de la Villette. The building stood vacant for 9 years. Since then, however, the building was rehabilitated into a center of history of cinema, with very little change to the outside as I understand it.